There is a large stand up board with a picture of a dog. 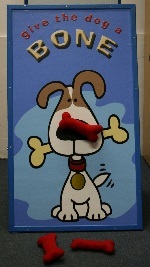 Players have three velcro bones that they have throw at the dog so they stick to its mouth. Large free standing board, bones and instructions. Large car or van to pransport it.